The Time Wrecker Trilogy centers around a fictional but incredibly controversial concept: timeline rectification. This alternative type of parole allows criminals to return to the day of their original crime and choose a different path. Throughout the series, I included news articles, blog posts, and opinion pieces that give different perspectives on the controversy. Should timeline rectification be legal? Even if it is legal, is it moral? 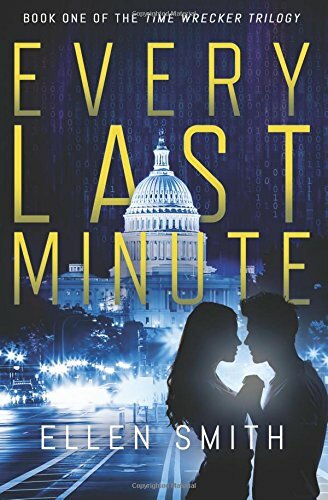 As I get Book 2 of the Time Wrecker Trilogy ready for publication, I'm sharing a few samples from Book 1, Every Last Minute, here on the blog. (You can read the first two samples here and here.) The third sample piece is below. Enjoy! Long ago, before timeline rectifications, before the Internet, before reality television or answering machines or any of the other modern-day annoyances that have come to plague my life, there was a young man. He was sixteen years old and his name was Johnathan. Johnathan was five-foot-eleven, played basketball at his high school, and was dating a girl named Becky. Like most high school boys, he aspired to many things: becoming an astronaut, visiting his uncle’s ranch in Wyoming, passing his geometry class. Johnathan did none of these things, because on one warm spring evening, he was riding his bicycle home from Becky’s house. He was out later than he was supposed to be and was pedaling home as fast as he could; trying, I expect, to make curfew. He was not wearing a helmet, as children often didn’t back in the seventies. He was not watching the road, and thus he did not see the car coming around a sharp bend up ahead. The driver of the car also did not see him. Johnathan was killed immediately on impact. I was the driver of that car. 1. Johnathan’s death was easily avoidable. · If only I had waited five minutes to go to the store. Alternatively: if only I had gone five minutes earlier. · If only he had reflectors on his bicycle, I might have seen him. · If only I had taken that turn more slowly. · If only he had been wearing a helmet. That a person should die due to factors as small and easily rectified as these adds an additional level of horror and injustice to that night. 2. His passing cast a pall on all who knew him . . . and many who didn’t. I have never claimed to grieve at the same level as those who knew Johnathan: his parents, his friends, his schoolmates. I can only imagine the burden of grief they carry and the hole that his loss has left in their lives. Despite never having laid eyes on this young man until the accident, after his death I became somewhat obsessed with trying to honor the life that I had, wholly unwittingly, brought to an end. I read his obituary, the memorial in his school’s yearbook, and every article the newspaper printed about the accident. It was his death and my role in the accident that caused me to descend into alcoholism, which additionally cost me my wife, my house, and my job. I went from being a full-time father to an every-other-weekend parent—that is, when I was sober enough to pick up the kids. After a hell of a fight and two years of sobriety, I have now regained a job, an apartment, and a strained relationship with one of my children. 3. Johnathan deserved to live. And don’t we all? Whether Johnathan had continued to play basketball or date Becky, whether he ever became an astronaut or passed that geometry class, he deserved to live. However, timeline rectification is a tricky business. The government does not simply turn back time for every sad old man who wishes he’d lived differently. There are four reasons that I will never be able to take back that night. 1. Legally, the accident was not a crime. Certainly, I have felt the weight of my role as a killer each day of my life. Legally, however, no charges were ever filed, and none were ever sought. This was an accident. According to the rules and statutes of the justice system, there can be no rectification for events that were not criminal. 2. There was a fatality. Timeline rectifications are not performed for incidents that resulted in a pregnancy or a death. I understand, in principle, why the Department of Timeline Rectification would make such a stipulation. In my heart, I think those of us who have seen crimes result in loss of life wish for the opportunity to turn back time even more earnestly. 3. The accident occurred before 2000. The technology for timeline rectification has existed since 1999, when the Supreme Court ruling was made. Presumably, Dr. Bennington had invented it before that, earlier in the nineties. However, partly due to the ruling and partly due to preventing some type of time paradox, we cannot change events that occurred before timeline rectification was first enacted under law. 4. The accident involved a minor. One of the facts I ruminate on the most is that Johnathan was killed in the prime of his life. Sixteen years old, with years of school and career and love stretched out before him. As much as I wish I could give that back to him, the law prohibits rectifying crimes that involve a minor, either as the perpetrator or the victim. Often, people who are perhaps well-meaning or perhaps not will claim that there is a good and worthy reason behind every tragedy. Some will press me to believe that Johnathan was an angel meant to be called home early or that his death must surely have inspired some new law, some spiritual awakening, some good act that made this tragedy understandable. There is none. From one man who wishes he could change his past, to those who could change theirs: seize the opportunity you have. Nothing is worth a lifetime of regret. Interested in reading more from Every Last Minute? The book is available now on Amazon, Barnes and Noble, and Books-A-Million. Ready to decide whether you would be a time wrecker? Take the quiz here to find out!